You must be a member of the Hanoi Arts & Culture Group to attend this activity. Would you like to join this group? Started by a ceramic making family, Protected content is the ideal place in town to explore the art of clay with traditional technique thoughtfully preserved to repeat itself in a contemparary concept. Handcrafted ceramics, though have been forgotten over times, can still be found in our little showroom - where the artful techniques have been passed down from generation to generation in the family. 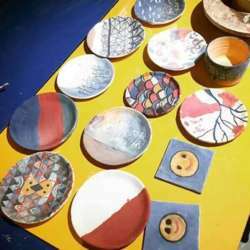 With our mindfulness of keeping the values alive, this ceramic workshop will guide you step by step the process of making handmade potteries, from shaping with a turntable to glazing. 02 of your works will be thoughtfully baked so that you can keep as a souvenir or gift your loved ones.